Apparently my Co-Blogger isn’t the only one having issues with Facebook pulling an account access stunt. Close to two weeks ago, Facebook pulled a rather insidious little move by trying to force me to download an anti-malware program. 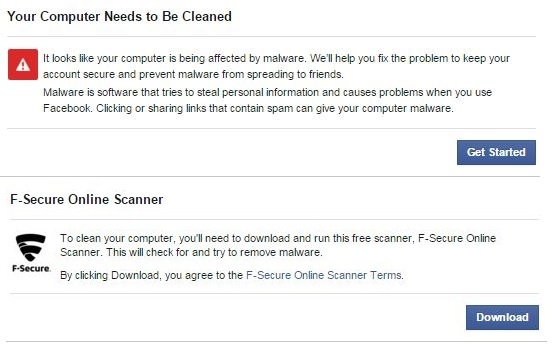 In fact, as of the publishing of this article, Facebook is still trying to force me to download an anti-malware program – but only under certain circumstances. I logged on to Facebook with no issue and returned 30 minutes later to the first screen below, “Your Computer needs to Be Cleaned”. Curious, I clicked ‘Get started’ and was sent to the second screen below. First, understand that I was being funneled through a ‘check point‘, which demanded I download a given malware application. There was no ‘skip’ option, either I downloaded this thing or I didn’t get access. Well, I’m not stupid, so I didn’t download the application. Instead, I ran both of my anti-malware programs and Windows defender. All three came up with next to nothing but some suspect cookies, which I deleted. I went back to Facebook and tried to log in again. No dice. Same message. I dumped all my of cached files, history, c0okies and temp files and tried to log on yet again but got the same message. I then decided to test a few things and attempted to log in to Facebook while logged into a particular Gmail account. To clarify, I use Google Chrome and have two Gmail accounts; One is my personal, family related account and the other is my blog/free lance writing account. For the sake of brevity in this article, I’ll call them PG and BG, for personal and blog gmails respectively. At first, Facebook attempted to force both accounts to download the malware application. After several days and multiple letters written to Facebook support, I was finally able to get into Facebook, but only when I was logged into my PG account. I was also limited to what I could post, though. I could post no links whatsoever in status messages or direct messages. So, I started another round of letter writing to Facebook. I did a little experiment with a close friend and had them log into my account. They received the same malware message — but their computer is located multiple states away and they don’t use the same browser, nor do they use Gmail. After that experiment, it became crystal clear: Facebook had flagged my account. As it stands right now, I can log into Facebook and interact normally so long as I have my PG account in use. The moment I switch identities to the BG account, I get the malware screens. Maybe their rather creepy Data Policy parameters logged my activity and decided to shut me down? Maybe another Facebook user got together with friends and reported my activity as spam? Who knows what the reason was, because Facebook sure isn’t telling me. Anyone who has had this happen to them, and/or watches Person of Interest, might wonder if Facebook is really Samaritan. Whatever the reason, what is key here is the fact that Facebook was trying to (and still is) force me to download a product. That’s not only flat-out ridiculously creepy it’s also arguably a violation of their own TOS. Side note: Some folks who had similar experiences reached out to me on Twitter. This entry was posted in EXCLUSIVE, LL1885 and tagged facebook, Malware Scam. Bookmark the permalink. I got around the block, initially, by clearing cache and cookies and “verifying” my account by answering security questions and inputting a code from my phone. All well and good, until about 12 hours later they implemented a 3-4 day link block and prohibited me from sharing any links (except for links to their own help files, most YouTube links, and some posts from Friends on Facebook that contained links – but not all of them!) I never got a reply from Support. The link ban’s been lifted. No explanation whatsoever. Sometimes it feels like they just want to remind us they have POWER. Hahaha… I caught up on my reading and did more art. I reminded ME that I have power – and it doesn’t flow from Facebook. Thanks for sharing my link – hope it’s helpful to someone! This happened to me too several times. It didn’t happen on my computer it happened only on my phone. The only way I got out of it was to shut off my phone and start it back up again. Can you set up a VPN? I don’t know if Facebook will allow connections with VPN. I recently had similar experience with OCS websites refusing access to my IP address. When signed in under different accounts I was denied access to different things. I spoke with district IT who originally recommended I request permission to view whatever. One item I was checking was the SIP school improvement plan. Another was staff. Anyway, I refuse to sign in and request permission to view public information at my child’s school. The sites are through Google. Even though I was using Firefox, the site pulled up my Google account. I’m thinking of using a VPN virtual private network. I just sent email to district IT to find out if their sites allow connections with VPN. I believe the choice is theirs.